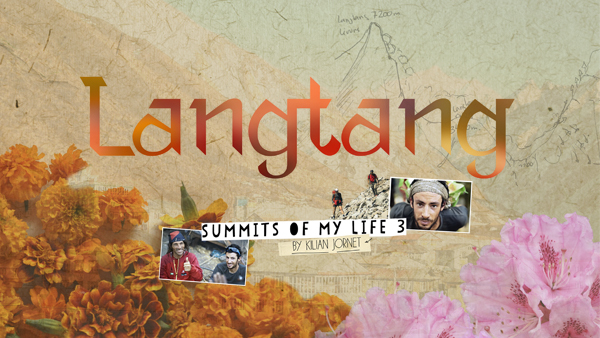 Kilian Jornet presents ‘Langtang‘, the third film in the Summits of My Life project. Directed by Sébastien Montaz-Rosset, the film is the story of a journey to the heart of Nepal. In April 2015, ultra runner Kilian Jornet is preparing for an expedition to Everest as part of his project, `Summits of My Life’, together with alpinist Jordi Tosas and filmmaker Sébastien Montaz-Rosset. Two days before departure, a 7.8 magnitude earthquake hits Nepal with devastating effect and Jordi’s beloved Langtang Valley is all but eradicated. Putting their original objective to one side, the team travel to Nepal with the hope of offering help in the place that they hold in their hearts. As the rhododendron flowers of Langtang herald the arrival of spring, nothing can prepare them for the level of destruction they find as they make their precarious way up a valley ripped apart by the force of nature. Langtang is an ode to life, a tribute to hope and a search for new horizons. “It was a difficult experience for all of us. Jordi Tosas has been to Nepal 27 times and it’s a very important place for him. Langtang was where I had my first himalayan experience and it’s a special place for me also. The village of Langtang disappeared completely and to see everything we knew completely devastated was very sobering, and I think it comes across in the film” Kilian said. ‘Langtang‘ is very different from the previous films in the Summits of My Life project. Athletic objectives are put to one side as the film documents the days following the earthquake with the team being some of the first to enter the Langtang Valley. Their emotions are reflected in the film, as initial confusion gives way to optimism. The Nepali people remain positive and optimistic as they gather their strength to rebuild their lives. “Langtang was a very particular experience for me, I have never filmed anything so emotional. It may seem like a tough story but it’s also very optimistic. Only the nepalese people can win this fight”, Sébastien Montaz-Rosset explained. Langtang pre orders and premier in Barcelona. The film is available now for pre order via the website Summits of My Life, with the film premier on 12th December. This year’s event will be on Saturday 12th December in the Aribau multiscreen cinema. Audiences will see the film together with the team, in the largest cinema in Barcelona seating 1174. This year the project is taking part in a humanitarian initiative. Kilian Jornet and the Summits team will raise funds to help with the rebuilding of 116 houses in the Langtang Valley. Details of the initiative will be announced at a press conference on 11th December.